"In the Dawn Era Calendar, first you wake up, then you live, and then you shine before going to sleep..." - Scalino C.
About the Nature of "the Universe"
Now, if you'd get close enough to any planet to see it as the Earth seen from the Moon for example, you would be too far from the others to see them with your bare eyes, well... except for what you can see of Venus or Jupiter with you own eyes from the surface of Earth, for example. So, let's continue the journey, and we first find ourselves into what is called the 'Local Bubble', an imaginary sphere of about 20 to 30 light-years in which are gathered our closest neighbouring star systems. That 'bubble' is included in a more complicated (three folded) structure made of nebulae gases and that kind of things - containing thousands of star systems - inside the 'Local Arm' of the Milky Way galaxy, which is one of the 3 or 4 spiraling arms forming one gigantic disc about 150,000 light-years wide, our Sun orbiting somewhere around 27,000 light-years from the galaxy's center, now renowned to be a giant black hole. Beyond the Milky Way, we find a cluster of galaxies called the 'Local Cluster' (wow... cosmic...) and beyond that, a guess maybe...? Well, more galaxies. And that's it, dude. Anywhere you would look upon, you would see more and more galaxies, separated by inter-galactic space. 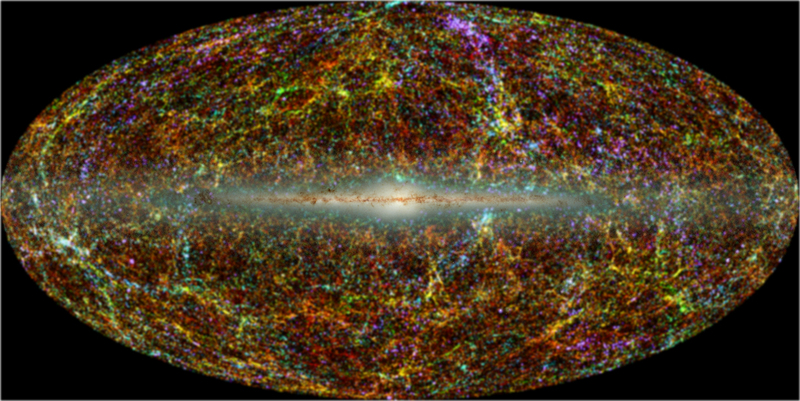 If you happen to be well informed in astronomy, in particular about the latest discoveries about the structure of the universe, you probably know that all these galaxies are architectured in a very specific way. Actually, they are not scattered at pure random; they are distributed on some kind of (more than) gigantic invisible cosmic web of which you can find a neat picture of here: Mass Repartition (this kind of picture is based on WMAP Sky Maps). You can also have a look at the videos I talked about in the article "Playing with the NHA Logo: The Tri-Trendao", where you will see beautiful 3D animations of thousands of galaxies seen at this "universal" scale. And as George Smoot points out at one moment in one of these vids, if you would be "there" in person, you wouldn't be able to see what you see on these 3D animations, because of the scale of those things. You would have to travel much much faster than light itself and things would appear to be completely different at that (very hypothetical) speed. Besides, those animations, as most of astronomical pictures and animations, are treated by computers to add artificial colors in order to visualise things which are actually there, but that your eyes wouldn't be able to see. In the case of galaxies networks, for example, white color is used to represent what is called 'Dark Matter', which is what this gigantic cosmic web is made of, and around which usual matter (meaning essentially galaxies, stars and gases) gathers, pulled by dark matter's gravity (and then by regular matter's one too). Now, the question that I'd like you to ask yourselves is this: do those "reconstructed" representations appear to you as more or less close to reality than what you would see with your eyes? Or you could also wonder about this: do our human eyes - even supported by telescopes to look farther - are the proper tool to observe the universe? We now know that only 5% of what the universe is composed of - what we call 'regular matter' (stars, gases, planets, ...) - interacts with light so that we can see it. The rest, dark energy (about 75%) and dark matter (about 20%) don't interact with light, and so we can't see it and therefore we have no clue about what they could actually look like. These heavily computerized reconstructions are our only means to get some visual awareness of these otherwise invisible things and then have a chance to better understand their nature. So, yeah, common sense could easily conclude that these reconstructions don't represent the universe's reality properly, but neither do our eyes, and they can only show us 5% of the universe's content. So, the first point is this, our eyes - on their own - will never tell us anything about the other 95% of the universe, because these 95% don't interact with light, therefore our eyes alone cannot be the proper tool to observe and fully understand the universe (and its nature). We need something else, and this something else is "our mind", but I'm gonna get back to that later on. Because, in order to really grasp the very sense of this calendar, we need to dig deeper than that. Cause the problem, you see... is all about light; or rather, its speed. A lot of you - I guess - have already seen pictures of our Milky Way galaxy, and not only pictures, but now things that start to look like "maps". And what I mean by that is: accurate representations of the position of each of all the stars we can observe in our galaxy in a 3D referential respecting distance scales. Let's imagine we would want to draw such a map (granted that we got all the shiny telescopes we need), we point the telescope towards a star, we calculate its distance from our Sun, we measure its vertical distance with the galactic plane, its distance from the galactic center, etc... whatever. We place this star accordingly into our 3D referential, and we skip to the next one. If the people who are drawing these "maps" are doing like this, they are not making maps of "the Milky Way as it is today", but of something that doesn't exist at all, and which is the collection of all the locations of the galaxy's stars where they were at the time the light coming from them was emitted, and each of them being at complete different distance from us, this length of time is not constant between one and the other. And even if the galaxy was turning in a totally homogeneous way (say, like an LP record), which is not the case (1), that wouldn't be sufficient to guarantee that relative positions between stars are conserved (because we're observing them from inside the galaxy itself). What I do know, is that the galactic map of "what we see from here" is fundamentally flawed and will never help us for sailing into interstellar space, because distant stars won't never be where we see them. And whatever the method that'll be used, the eventual correct map of the galaxy will require to take into account several factors including the speed of light, distance of stars from observation point (a spacetime distance), stars' orbiting speeds (around the galactic center), and so on. So once again, the correct map is not made of "what we see when we look at the galaxy" but of "what we see + lots of very complicated calculations", calculations that are the product of our minds. In order to conclude about all this, let's plunge the sword all the way to the brim. Finally, if you think about it, the only place (that we know of) where the universe can be "seen" as it is (more exactly as close to what it is as currently possible), rigged of all the attributes we know about it - and not only as what light shows us - is our minds. It is there and there only, in our imagination, and in these minds' extensions we use to call "computers" that a fully featured "vision" of the universe can be built. So, in practice, what we use to designate by the term "universe" is mostly the mental vision we have of it. Or to be more accurate, the most largely shared vision of it. Nowadays, the most largely shared vision of it is a mix of the original Big Bang model enriched by the WMAP & Planck satellites' observations of its residual background emissions (and their consequences on the equations), the marvelous pictures of deep space made by the Hubble telescope, the knowledge we have of quantum physics, and what you can see in the videos I talked about, that is to say the kind of "mapping" resulting from the Red Shift Surveys. Besides, to a certain extent, especially for the layman and public masses (but history has shown that great scientists and astronomers have often been influenced by it), the culture of science-fiction whether in literature or in cinema, can also contribute to that mental vision we share of the universe. And here we are, my fellow dudes, right at the core reason behind the Dawn Era Calendar... And let me rephrase it a little bit, pushing it to its full extent: the only place, in the universe as we know it, where the universe can be seen as closely to what-it-is-now as possible, is - to our current knowledge - the very minds of human beings supported by their electronic extensions (without forgetting that "what-it-is-now" requires extrapolative calculations from what we get - which is actually "what-it-was" due to light speed). Considering the human species as having been cast out of nature in any way is probably the biggest philosophical mistake one could (and largely still can) make about the question of Humanity's place inside the universe; we are an integrating part of the universe, we are the children of some of the oldest stars that've ever shone out there (grand-mas), the children of rogue asteroïds who came from outer space travelling for millions and millions of years (grand-pas), the children of the warmth of our sun (the father), and the children of the buoyantly blooming Earth, our dear mother. We cannot be more "in the nature" than what we are, and we should begin to act accordingly. Moreover, anything we created, whether material, biological, mental or spiritual is also a part of the universe and of nature. It's just that, nature is changing, like everything else. 1: The closer they are from the galactic centre, the faster they turn. The thing is, we had a lot of different visions of the "world out there" since the beginnings of our wonderings about it, and today it's quite natural to know that the big bang model is just a model of representation and as such, a kind of map, therefore not the territory. Now, think about it, this was the first time in history, when we adopted a new vision of the universe, knowing that it was just a vision, just a practical way to exchange about it, to study it, to better understand it and expand the vision. For the very first time, the "map" was really auto-reflexive, the map was aware of its own "map-hood". If you replace it within the history of our ways to consider and describe the universe, it was the time when we began to understand - collectively - that what we were seeing of it was only our (very) relative way of perceiving it. And so we built a model, based on general relativity, which was taking this fact into account. Mentally speaking, it was the first meta-move in our understanding of the universe. Before it, people talking about "out there" were always referring to "what was out there" (and quite often it was on the air of "either you believe what I say or I kill you"). With the big bang model, our representation of the universe has become a representation of "what we perceive and know of what's out there". That's why I thought we should have a calendar that is taking this particular historic fact into account. And thus today which, in the Gregorian calendar, is June 2010, the 2nd corresponds to Vida 83, the 71st in the Dawn Era one. And technically, it ought to be understood as: the 71st day of the 2nd phase of the 83rd year of existence of the universe as we see it. Here, the calendar loses a bit of its universality, since it takes a North hemisphere / temperated region's point of view, but well, I'm living there and this is typically what it is all about, nope? Relativity? So, 'round here, we have 4 seasons that can be easily distinguished, that's why I divided the year into 4 phases, with the idea of keeping it as simple as possible. So 365 days (on regular years), or 364 + 1, or 91*4 + 1. The basic number of days for each phase: 91 days. The day left to make 365, I chose to add it to the first phase, systematically, as well as the supplemental day of bissextile years. Concerning their names, I went for emphasizing what I saw as the main fact about each phase. Well, this is the tougher part of it, knowing how to convert a date from one calendar to the other and vice-versa. One good thing, is that the table above gives you fixed landmarks at the exception of the Auro phase, depending on the bissextiality of the year. The Sola phase, for example, will always begins on the 23rd of June, and so, firstly, use the table to remember starting dates. Abbreviations: SD = starting day; NDFM = Number of Days to Finish current Month; GY = Gregorian Year; GM = Gregorian Month; DY = Dawnian Year; DP = Dawnian Phase; GD = Gregorian Day; DD = Dawnian Day; FGMD = Full Gregorian Months Duration. Ex: Let's do it with today's date. June 2010, the 2nd. We're not yet the 23rd, so we're still in the Vida phase, SD = 24.03, DP = 02, NDFM = 8. DD = 71.02.83 = Vida 83, the 71st. Of course, there is some exceptions (if not it wouldn't be fun), in cases where you're between SD and the end of the corresponding month, for example on March 28th. But then it's easy, DD = GD - SD + 1 = 28 - 24 + 1 = 5. It's Vida, the 5th. Once again, if you remember starting days you're pretty much done. And remember that concerning year conversion, this time the exception case is between Auro the 1st and Auro the 10th. Find the starting day for the phase you're in, and the corresponding NDFM. If DD > NDFM: well... the equation is a bit more complicated to write down, and it's much easier to simply count. Basically DD represents the number of days since SD, so let's take an example... completely random... Narke 62, the 49th. SD = 22.09, NDFM = 9, and we're 49 days later, or yet: NDFM + 40. October having 31 days, these 40 are decomposed in 31 + 9. So, overall we got: 49 = 9 + 31 + 9, it was November, the 9th. A -You may feel your mind is pulled here and there by conflicting fears and feelings, often making you unable to take decisions, or even stopping you from doing what you really want to do and making you do things you later regret. People often say, genuinely, "I wish I hadn't said / done that!" But you're also being anxious. An anxious mind accepts no chance of change. An anxious mind thinks, "Well, life is hard, but what can I do?" and withdraws, which is the equivalent of running away. A fit mind thinks, "Right then, what can I do?" and interacts. Fortunately, a fit healthy mind IS 'your nature'. We become unfit when we turn away from our nature, and this is what has happened. You know this unconsciously because you want to stop. Intal can help you get back into alignment with your biology and show you techniques for improving both your self control and your decision-making abilities by giving you techniques to reduce anxiety, improve your brain chemistry and change your habits. If you want to know more about how, you'll have to read the tutorials!